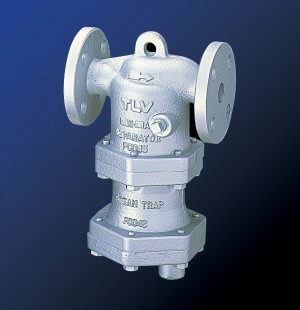 TLV's DC3S steam separator with built-in steam trap can reach up to 98% condensate separation efficiency. The DC3S separator with built-in steam trap achieves up to 98% condensate separation efficiency. Steam separators are used on steam transport piping and at the inlet of steam-using equipment to discharge condensate and water droplets within steam. The DC3S steam separator removes condensate with up to 98 per cent efficiency, which produces a noticeable improvement in the quality of steam and can help heat conductivity by supplying dry steam to the process. This can lead to increased valve and equipment service life, as well as improve product quality and the performance of downstream equipment. Dry steam also increases heating efficiency, which eliminates uneven heating and reduces the amount of steam used by the process. The DC3S separates condensate and water droplets using TLV's cyclone-effects separator system, which rotates the steam using a complex series of fins to change the flow into a high-speed cyclone flow and create a centrifugal force. Once the separated condensate accumulates at the bottom of the separator, it is continuously discharged via a self-modulating free-float steam trap, which prevents it from being mixed with outgoing steam. Available with screwed or flanged connectors and in cast iron or ductile cast iron body materials, TLV's DC3S has a maximum operating pressure of 21 barg and maximum operating temperature of 220°C.